I would love to have you join me! Add your link below. The strawberries are starting to show up in my area and I need another way to use those little jewels. 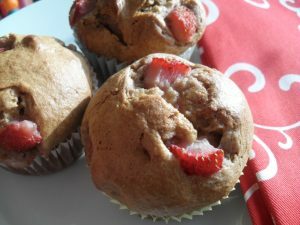 You know, besides just popping them straight into my mouth while hiding from the kids… I wanted to incorporate strawberries into a muffin with another flavor that complemented them for our busy weekday mornings and lazy weekend snack-times. After mangos, strawberry-banana is my kids’ favorite flavor, so the choice was a no brainer for me. I based the recipe on my regular banana bread recipe, however I wasn’t looking for the usual texture you get from banana bread for this muffin. I was striving for something lighter and more in keeping with summer. I reduced the banana so it wouldn’t overpower the tastiness of the strawberries, and added a bit of vanilla to round out the flavors. Other berries or chopped peeled peaches are also delicious in this muffin. Just use the same amount of fruit to replace the strawberries. Sprinkling on a bit of coarse sugar crystals on the muffin batter just before baking adds a bit of crunch and is a nice finishing touch. I hope you enjoy it! Printer friendly recipe card for multiple batches for freezer cooking. Mix mashed bananas, brown sugar, oil, and eggs together in a blender. Blend until smooth. In a separate bowl, combine gluten-free flour blend (or individual flours), xanthan gum, baking soda, baking powder, and salt. Add banana mixture and stir just until combined, removing any lumps. Gently stir in sliced strawberries. Divide batter into 16 paper lined muffin cups. Bake at 350 degrees for 25 minutes or until a toothpick inserted in the center comes out clean. Remove from muffin pan and allow muffins to cool on a cooling rack. To make egg free: Do not add eggs. Mix 2 tablespoons ground golden flax with 6 tablespoons water. Heat while stirring until mixture has thickened. Allow to cool to room temperature. Add flax mixture to recipe when eggs would have been added. Also, increase baking powder to a total of 1½ teaspoons. To freeze: Allow muffins to cool down completely. Package in zip-seal freezer bags. Remove as much air as possible from freezer bag, seal, label and freeze. 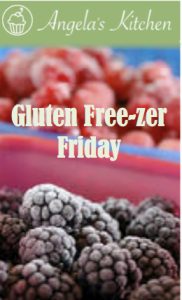 This post is linking up toFreezer Food Friday on What A Crock! Yum! These look so good! My husband has a number of food allergies, including "oral allergy syndrome" which means he's allergic to raw fruits and veggies... this is an awesome way for him to get to enjoy some fruit! Thank you!!! These sound wonderful! I'll have to make a slight adjustment for a sugar replacement, but I am looking forward to experimenting. I'd like to try the once-a-month cooking idea for my special diet and am so glad I came across your site. Thank you for sharing your experience and wisdom!